If you open up Legault’s The Other Poems looking for answers, you will find them; they are multitudinous, ubiquitous, and as you progress further and further into the book, the answers, which might’ve benefited at one time from the context of the question, begin to make those questions seem altogether unnecessary—absurd maybe—and the answers, in some way, start to preclude even the need for the existence of the questions in the first place. The poems are bite-sized sonnets, and the conversations they contain seem indebted (tonally speaking) to both Berryman and Beckett in equal proportion—Mary Jo Bang notes half of this debt in her blurb on the back cover, commenting that “Beckett would love Legault.” Indeed he would. But Berryman’s The Dream Songs of course inform the larger formal trajectory of this book (76 songs in Legault’s book versus Berryman’s original 77—one less is perhaps a deliberate concession on the part of Legault), and I imagine The Other Poems as a whole pleases and cofounds readers in equivalent measure to Berryman. MONEY: It’s me, isn’t it? The first two lines seem like a reluctant admission by the poet/speaker. That like other poets before him, he too is “going in.” But that admission breaks down in the next stanza when the other (everybody) takes over. What follows may seem too noisy or absurd to the reader at first glance, but it transforms, page by page, into something that’s deceptively thoughtful and emotionally relevant—the way a pastoral scene that’s been hand-painted on an ostrich egg may seem absurd at first glance; but then, the longer it sits atop your fireplace mantle and the more unique conversations it seems to spark, the more inexorable it becomes. The poems in Legault’s book are like that—they are like worldly/otherworldly souvenirs. Stairs always lead to more stairs. Enough stairs make a house. 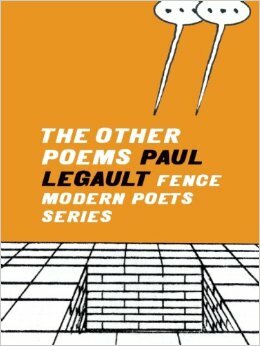 I imagine there will be those readers who will find the surface value of Legault’s experimentation, his wit and his timing laudable, and I imagine there will be an equal proportion of readers who will impugn his craftsmanship for the lack of familiarity they feel within these poems—the uneasiness they feel inside his house. There will be others, however, who approach the book more cautiously and honestly, who will find substance in these poems (“Like a box / made of weather”), subsistence, and a genuine reason to come back for more.